Join the businesses of South Park this Saturday, July 22, for our Summer Walkabout. Grab a bite at one of South Park's restaurants or bars and take a stroll throughout the neighborhood to visit all our unique retailers. Longer days give reason to Walkabout! FREE trolley rides will be running from Juniper & Fern to the south end on Beech & 30th all evening. Pick up the 2017 Summer Walkabout Guide at the South Park Info Booth on Juniper & Fern Street to see all the retail and restaurant specials in the neighborhood. Some highlights listed below! * Warshaw Provisions GRAND OPENING! Live set from CREEPXOTICA as they celebrate South Park’s newest addition in creepy bossanova fashion. * Bad Madge is offering 20% off to anyone in costume to celebrate Comic Con! Refreshments and El Caballero playing guitar outside the shop all night long. * KINDRED with be mixing up a complimentary summer punch for all those who dare to consume it's nubilous inventiveness. * West Grove Collective will be hosting local author Kristin Rockway for a book signing of her book, The Wild Woman's Guide to Traveling World along with trunk shows from Studio Maureen and jewelry maker Suzanne Morgan. * Graffiti Beach will be offering complimentary cocktail tasters by Nostrum and featuring trunk shows by Hex backpacks and Salt + Stone all-natural sunscreen. * Hale Productions will be hosting a complimentary summer themed photo booth at their studio. * Gold Leaf will be serving up palomas all night long while hosting Viva Pops outside the shop! * Woof and Purr is having a meet and greet with Surgeon Dr. Paul Farrell and serving up popcorn for the people, treats for the pets, dragon rides for the kiddies and pinball for everyone! * So Childish will have a face painter and hosting a lemonade stand complete with treats from 6-8pm. * Grant’s Marketplace with be serving up pretzel bites with a housemade cheese sauce. Show us your best shots. 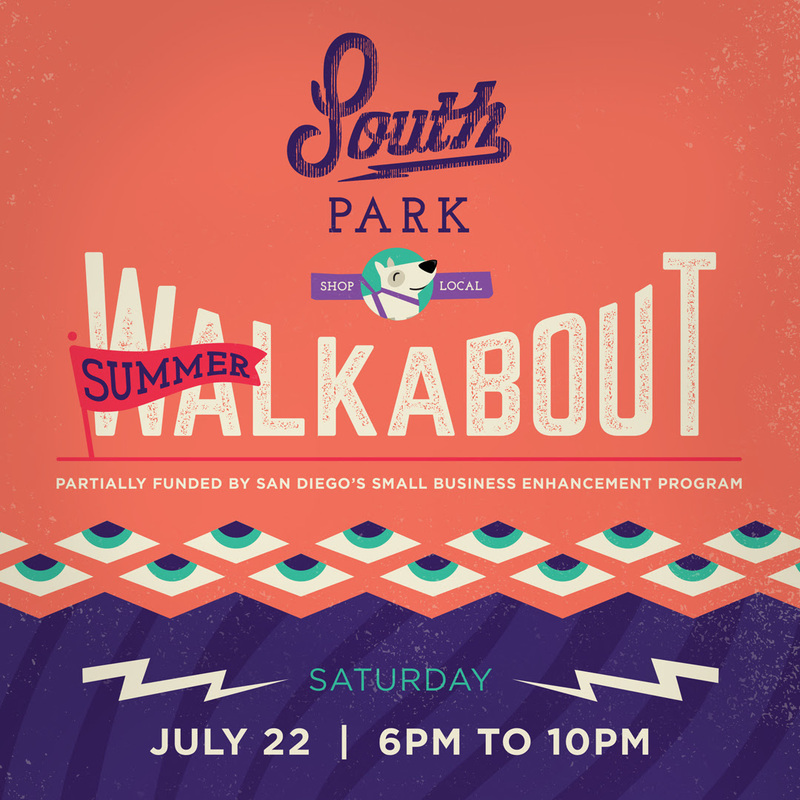 Post your pic showing us how you enjoy the Walkabout on Instagram with #southparksd and tag @southparksandiego! We'll pick our favorite pic and the winner gets an awesome collection of gift cards to some of the great South Park restaurants and shops. Pro Tip: Some of the stores and restaurants offer special discounts for #southparksd selfies. Be sure to ask while you shop!